Every year we see a new Stephen King adaptation. This year, “Pet Sematary”was remade nearly 30 years after the first film and 36 years after King’s original novel was released. Some King adaptations are complete misses, while others become known as some of the best films ever made, much like “The Shining” and “Misery”. “Pet Sematary”, however seems to land somewhere in between. 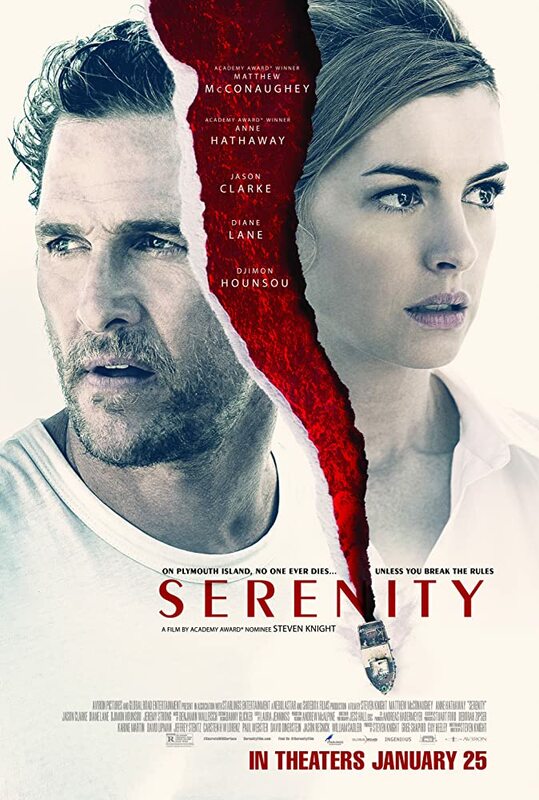 Dr. Louis Creed (Jason Clarke) and his wife Rachel (Amy Seimetz) move from their Boston home to Maine with their two children; their daughter Ellie and their son Gage. They soon discover, thanks to their friendly neighbor Jud (John Lithgow), that there’s a dark and brooding burial ground for pets in the woods behind the house, often accompanied by mysterious children wearing mask who perform some sort of ritual. When the family cat dies, they bury him, which leads to some creepy zombie mayhem that befalls the cursed family’s lives. The original 1989 movie was campy and had a low production value, but that doesn’t mean it wasn’t entertaining. The new “Pet Sematary” is quite entertaining at certain points, but at others it drags through its predictability. From the beginning of the film, you can see where it’s going, whether or not you’ve seen the original or read the book. It doesn’t necessarily take away from the creepiness of the movie, but it makes it difficult to care about the outcome. While the original wasn’t very scary, the remake ups the ante on the creep factor. It’s visually dark from start to finish, making the atmosphere incredibly eerie. Just like most horror movies these days, there’s plenty of jump scares to go around as well. These are used cheaply and can be cliché at moments, but they’re effective enough to make the film as scary as it should be. The plot line surrounding Rachel is by far the creepiest part of the film. Since she was a child, she had been cursed by the fact that she accidentally killed her bed-ridden sister with a dumbwaiter. She’s constantly haunted by the sound of the dumbwaiter coming down and she often has shocking hallucinations. It’s easy to tell that “Pet Sematary” is a great story, on top of the fact that it was written by one of the best working authors of spooky fiction. The film however, isn’t as great as the story itself, which is likely due to the direction and performances. However, if you’re in the mood for a fun, creepy movie, “Pet Sematary” should do just fine. Jordan Peele returns for his second feature length film after the massive success of the cultural phenomenon that was “Get Out”. The horror, mystery, thriller was a social commentary on racism. However, this time with “Us” Jordan Peele gives us a thought provoking message that’s suggests that the true enemy may be ourselves. Lupita Nyong’o stars as both Adelaide and Red, Red being her evil self who shows up at her family’s beach house alongside doppelgängers of her husband, daughter and son. These doppelgängers are known as “the tethered”. They look just like them, but act and sound differently as they attempt to murder their human selves. “They won’t stop until they kill us or we kill them”, says Adelaide in an attempt to gather her frightened families nerves’ back to reality. Peele’s direction is impeccable and is even more established than in “Get Out”. His visually style and tone is becoming more clear with the unique camera movements and haunting music. From the very first frame, you can tell you’re watching something special. The standout performance comes from Nyong’o who previously won on Academy Award for her performance in “12 Years a Slave”. With “Us” it seems she may be in the running for another one. Her talents shine through portraying two identical characters so differently. She plays a caring mother who will stop at nothing for her children’s’ safety, to an insane and stone-faced killer. As the runtime goes, you begin to forget that any of these actors are portraying two versions of themselves. In addition to Nyong’o though, the rest of the cast does a stellar job. Winston Duke plays her husband Gabe and his tethered self, Abraham. Duke is quite funny in most of the movie, acting as the much needed comic relief. “If you wanna get crazy, we can get crazy.”, he says as he walks towards the end of the driveway as he attempts to threatened the tethered, until he realizes they’re not exactly who he thought they were. “Us” is marketed as a horror film, but there’s much more to the terror and blood that you see in the film. Yes, the break in sequences is beyond creepy, and the very concept of having a doppelgänger try to kill you is the stuff of nightmares. However, “Us” is also a mystery, a thriller, a comedy, and in many ways a family drama as well. It has much to offer in its two hour runtime, making it one of the best horror films of the decade. In a near dystopian future, about ten years after their arrival, aliens have taken complete control of the government. Set in Chicago, “Captive State” explores the lives of the human beings being forced to live under their control. Rafe (who has since been presumed dead) led an unsuccessful but meaningful uprising against the aliens with a group of people called the Phoenix. However, things start to change for Rafe’s younger brother Gabriel when William Mulligan (John Goodman), a Chicago police officer looks for information on Rafe. “Captive State” isn’t the typical type of alien invasion film like “War of the Worlds”. Instead is focused on the humanistic portion of those stories much like in films like “District 9” and “Arrival”. However, it’s unfortunate that “Captive State” lacks the conference and flow that those films possess as there are often way too many plot lines occurring at once, making the film much more complicated than it needs to be. There’s a great idea in the screenplay, but the amount of characters and plot lines over stay their welcome. The film attempts to act as a social commentary, but the message can be construed due to the abundance of unnecessary fluff thrown in the mix. There isn’t as much screen time with the actual aliens as hoped, but when we do see them, they’re visually inventive to say the least, much like in the critically acclaimed “Cloverfield”. Similarly as well, there’s plenty of action and violence seen in the film. Those scenes can be fun to watch as well as being incredible tense. “Captive State” seems to be successful in some of its aspects and not so successful in others. It’s entertaining but it’s not an easy film to get through and by the end of the movie, you’ll either be thoroughly satisfied or completely confused. More than anything though, the film is meant to be very dark as it portrays the possible end of human life. It can be difficult to recommend these types of films for that very reason. If you’re looking for an easy, fun sci-fi thriller, this may not be it, but if your into though provoking movies, this might be your cup of tea. The newest in the Marvel Cinematic Universe gives us another important step in the superhero genre, much like last year’s “Black Panther”. Representation in film is starting to expand and superhero movies are contributing to a large extent of it. “Captain Marvel” stars a lead female superhero, being the first in the Marvel Universe to do so. We do have female superheroes like Black Widow and Scarlet Witch, but this is the first time Marvel has given us a stand-alone film staring a female lead. However, while “Captain Marvel” is very empowering, its plot and direction however are quite flawed. The movie goes very quickly to the point where it feels rushed. So much happens within the two hour runtime and it feels like we don’t have any breathing room in between to take it all in. Brie Larson stars as the main lead, yet gives an underwhelming performance. She’s an incredible actress and gave an Oscar winning performance in the acclaimed drama “Room”, so her talent can’t be doubted, which draws conclusions to the performance being a result of the poorly-written character. Captain Marvel doesn’t show a lot of ranged emotion and seems cold and distant. Maybe that’s how she’s portrayed in the comics, but in the movie it makes it difficult to connect with her or the center of the plot. The supporting cast is well stacked with talented performers as well. Samuel L, Jackson stars as a young Nick Fury, Jude Law plays Yon-Rogg, Annete Bennington plays Captain Marvel’s Air Force commander and Clark Greggs returns as his character from the tv series “Agents: of Shield”. However some of the relationships between these supporting characters just don’t work. The main friendship duo between Nick Fury and Captain Marvel is one of the more enjoyable aspects of the movie, but the interactions between the other characters seemed forced and a bit out of place. Just like every other Marvel movie, “Captain Marvel” has plenty of humor throughout. The style of comedy that is present in these movies can be hit or miss with audiences. Odd are, if you enjoyed the humor in “Avengers: Infinity War” or any of the others for that matter, you’ll probably enjoy the same thing here. “Captain Marvel” is a flawed movie, but that doesn’t mean it can’t be fun. There’s plenty of action sequences and the film has its very empowering moments. It’s disappointing however, that with an important movie like this, it wasn’t as entertaining or well-made as “Black Panther” or “Avengers: Infinity War”. 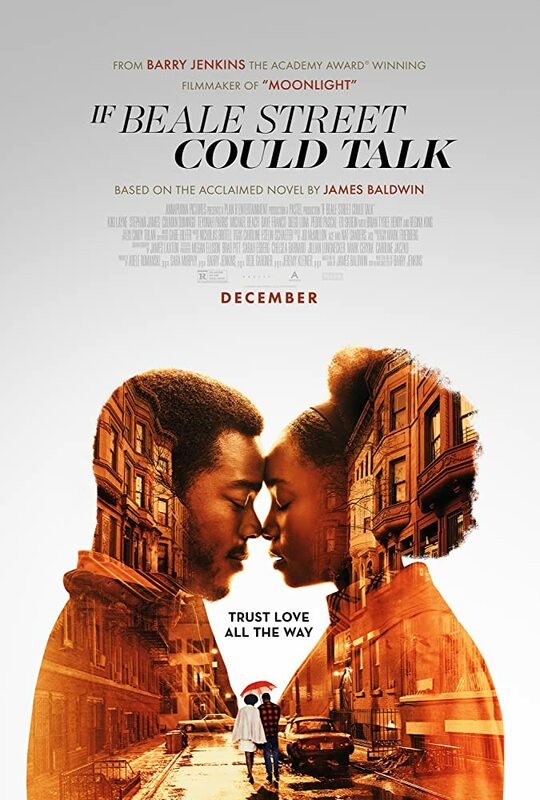 Based on the novel of the same name, this James Baldwin adaptation directed by film genius Barry Jenkins focuses on a young African American woman (Tish) in Harlem who is pregnant with her first child, while the father (Fonny) is imprisoned for a crime he didn’t commit. She and her supporting family scramble to prove his innocence before the baby is born. The film is a celebration of the importance of love and family, but also shows the dark side of humanity through its portrayals of racism and hatred. Barry Jenkins is a fairly new filmmaker, but a talented one. He wrote and directed 2016’s Best Picture winner “Moonlight”, a story about a gay African American in Miami Florida, and his journey through self-discovery. Now, with “If Beale Street Could Talk”, he ups the game on emotion and powerhouse performances. Jenkins has a distinct visual style to his films. He loves to use close up shots of a character looking directly into the camera, as if subtly communicating their emotions with the audience. His films are also very color-driven. Moonlight has tons of purple and blue shots, while “If Beale Street Could Talk” is riddled with shades of yellow and brown. His films are beautifully to look at, especially his latest feature. Tish is played superbly by Kiki Layne, a promising newcomer to the industry. With her performance alongside Stephan James (Homecoming) as Fonny, this on screen couple is one of the most chemistry-driven and realistic depictions of true love in years. “If Beale Street Could Talk” will surely set these two excellent performances on the map for greater gigs to come. The powerhouse performance here though is Regina King as Tish’s mother Sharon. King gives the audience her raw emotion that seems to get more intense scene by scene. The exception though, might be in a moment towards the beginning where family dynamics clash in a heated and gut-punching argument that ends up being the scene that stays in the mind for hours after viewing. From start to finish, watching “If Beale Street Could Talk” is more of an emotional experience than anything else. The love and romance is so real, the cinematography brings the story to life, and the music wins you over, making the film one of the most beautiful romance films in recent years. 2018 was a pretty good year for romance with Bradley Cooper’s “A Star is Born” making noise with mainstream audiences and “If Beale Street Could Talk” quietly coming through under the radar. As outstanding as both of these films are, it’s “Beale Street” that takes the cake in terms of bringing fictionalized love to life. Robert Zemeckis’s newest film focuses on the true story of Mark Hogancamp, a victim of a brutal attack who uses his own doll creations as a way to cope and help himself through recovery. Zemeckis is known best for directing the groundbreaking films; “Forrest Gump”, “Cast Away” and “Back to the Future”. However, with “Welcome to Marwen”, his directing talents don’t shine as bright as they do in his other films. The film stars Steve Carell in both live action and animation. In his live action scenes, he’s Mark Hogancamp. In the animated scenes, he’s Cap’n Hogie, a miniaturized version of himself as a World War II soldier who fights for both his own life and for the women of Marwen; the fictional town his doll creations are set in. Throughout the whole film we see snippets of his personal life and the struggles that come with his recovery, and animated recreations of what Mark visualities as he takes pictures of his Marwen dolls. The concept of “Welcome to Marwen” is pretty captivating. However, if you really want to understand what Mark went through, seeing the documentary on his life would most likely be much more informative. “Welcome to Marwen” attempts to add heart and humor to this story, and unfortunately much of it falls flat. There are clear positive intentions behind this screenplay (also written by Zemeckis), but the film never seems to be what it’s trying to be. Steve Carell delivers a great performance as always. He is one of the most raged actors working today as shown from his silly, yet layered performance as Michael Scott in “The Office” to playing the deeply disturbed wrestling coach in “Foxcatcher”. Here, he delivers just as much range and is without a doubt, the best reason to watch “Welcome to Marwen”. Other than Carell though, the film isn’t as worth the trip to the theater as you would think. The animation sequences seem oddly out of place (although it is clear what they were going for), the dialogue is often questionable, and we don’t get to see as much of the other vital supporting characters as we think we would. The film is an overall disappointment, which is surprising given the name of the lead actor and the reputation of the director. 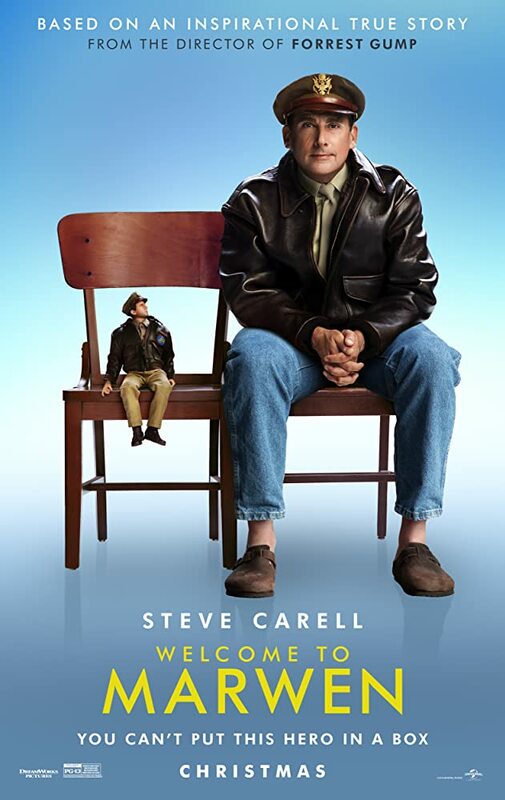 However, all that is important to know is that “Welcome to Marwen” isn’t the touching, biopic its markets itself to be. Currently available to stream on Netflix is the latest Coen Brothers’ dark comedy, “The Ballad of Buster Scruggs”. The movie is an anthology film that consist of six different stories, each taking place in the Old West where death and mayhem can ensue at moment and with any individual. That seems to be the central theme through these six stories; death. However, the Coen Brothers, being the brilliant filmmakers they are, are able to make that central theme comedic, thrilling, somber, enthralling, romantic, or even mysterious. 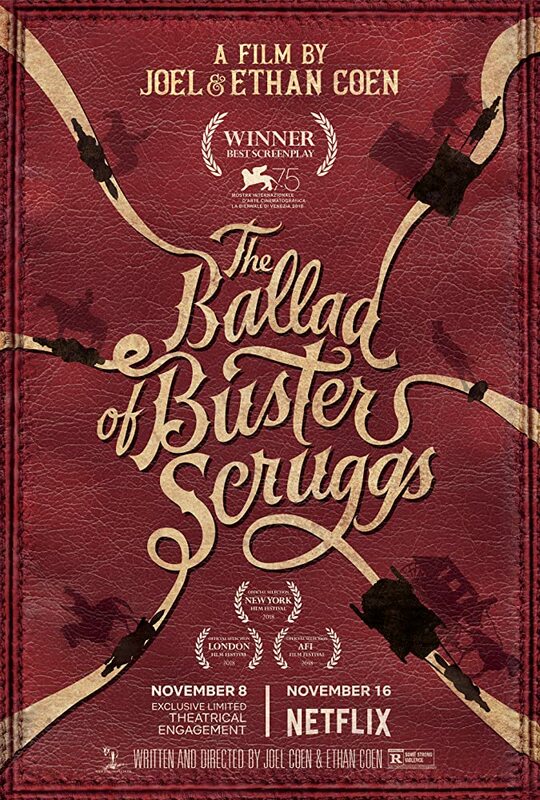 The first story is about a man named Buster Scruggs, an outlaw whose choices of killing and mayhem may come back to bite him. This one is only about ten minutes long, even though this story’s title is also the film’s. We then move on to a story about a robber who constantly finds himself getting hung by the neck, a story about an entertainer on the road who uses the misfortunes of another to make money, a gold digger who finds himself in a messy situation, a romance formed from the death of a relative, and a ride in a station wagon that is anything but what it seems. Some stories are better told than others, some more fascinating than others. “The Ballad of Buster Scruggs” is not consistent enough to be all that rewatchable. However, what the Coen Brothers never fail to do is entertain. Their unique form of storytelling, dialogue, direction, and their ability to make humor out of the darkest of things are what keeps this film together and allows for an entertaining experience on that first watch. The movie stars Tim Blake Nelson, James Franco, Stephen Root, Clancy Brown, Liam Neeson, Tom Waits, Zoe Kazan, Brendan Gleeson and many others. No actors are ever reused, so each story seems completely fresh after the previous one. The Coen Brothers are best known for their work on their previous films “Fargo”, “The Big Lebowski”, “Inside Lewin Davis”, “A Serious Man”, and ‘No Country for Old Men”. The list does go on, but their resume is so packed, it would take up too much room here. Not all of their movies were as well done as these, but what they manage to do throughout their filmography is stimulate the mind in a philosophical sense. Their films may make you laugh (“The Big Lebowski”), disturb you (“No Country for Old Men”), or do both (“Fargo”). However what all of their films seem to do is make audiences reflect on a philosophical question that the film asks. This time, it does it six times in one film. “The Ballad of Buster Scruggs” goes up there with some of their better films. Whether it be because of the cast, the cinematography, the dialogue or the filmmakers’ brilliance, the film deserves to be seen at least once. 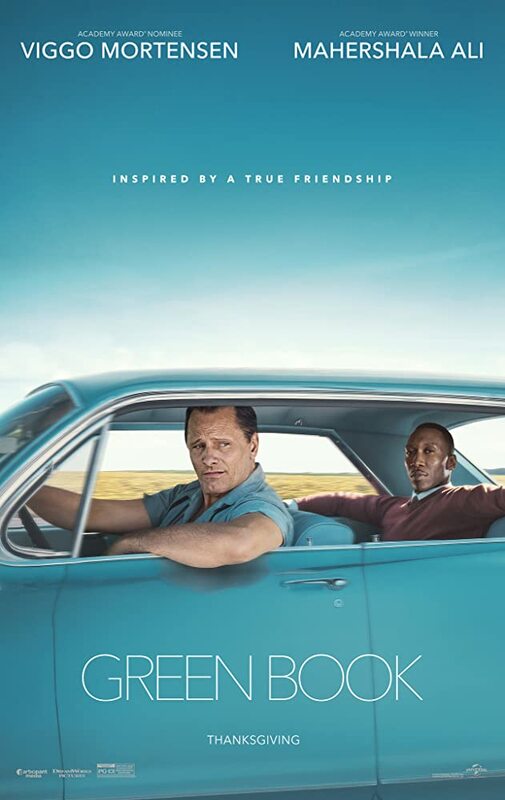 Directed by Peter Farrelly, “Green Book” is a true story about an Italian bouncer who becomes a driver and personal assistant to an African American pianist in the early 1960s. After Tony Lip’s bouncing job gets put on hold for a few months, he is referred to Dr. Don Shirley, an extremely talented musician who is going on a two month tour in the Southern States until Christmas. He hires him to get him from gig to gig, but also to protect him from those who do not accept his skin color. After hearing what he’ll be paid, Tony takes the job, but during their time together, a friendship blooms and turns into something neither of them expected. Race is a recurring theme throughout “Green Book” as Dr. Shirley consistently experiences discrimination, even at the venue’s that are paying him for his talents. At first, Tony seems indifferent when it comes to African Americans and has plenty of ignorant assumptions. However, after getting to know him, we see Tony begin to change and become a caring and compassionate friend to Dr. Shirley. While that transition has plenty of emotional bumps on the road, their connection seems innate. While race is a huge factor of the movie, the film is actually more about friendship and the strong impact it can have on the human heart. Sometimes friendships can unexpectedly develop and go on to last a lifetime. “Green Book” beautifully displays this message in the most heartwarming of ways. The film can be similarly compared to John Hughes’s “Planes Trains and Automobiles”, a comedy about two strangers who meet attempting to get home for Thanksgiving and end up becoming best of friends in the process. Not enough bromance movies are made these days, but “Green Book” can fill that gaps on its own. The most noticeable reason for the film’s success is the acting. The two main roles were perfectly casted and its difficult to see anyone else playing them and doing as great of a job. Viggo Mortensen plays Tony and Mahershala Ali plays Shirley. The chemistry between these two is perfectly acted out, and their talents seem to bounce off each other in a way that makes for a touching bromance. Both have an excellent track record, with Viggo starring in the critically acclaimed “Lord of the Ring” trilogy and “Captain Fantastic, and Mahershala Ali winning a well-deserved Oscar for 2016’s “Moonlight”. “Green Book” is an incredibly heartfelt and touching story that keeps a smile on each audience members’ face for the majority of the runtime. With the holiday season officially here, this film could not have arrived at a better time. If you’re in the mood for a nice feel-good story, “Green Book” is without a doubt the one to see. For those unfamiliar with the original, “Suspiria” is about a ballet academy run by witches. When a new coming dancer named Susie Bannion shows us, she begins to discover what truly lies behind the company’s mask. That’s about all that Luca Guadagnino’s version has in common with Dario Argento’s original. However, that does not mean, in any sense, that “Suspiria” does not live up to its predecessor. This film is one of the most unique, original, horrifying, mystifying and stomach churning movies in years. In this version, when Susie Bannion (Dakota Johnson) arrives, she is welcomed in open arms by Madam Blanc (Tilda Swinton) and Miss Tanner (Angela Winkler). Contrary to Argento’s “Suspiria”, here we know right off the bat that witches inhabit the school and are in search of a replacement for the dying Mother Markos, a grotesque looking witch who is only talked about until the end. Miss Tanner and Madam Blanc see potential in Susie, which shakes the school to its core, as Susie’s friend, Sarah (Mia Goth), grows more suspicious scene by scene. Separate from the main plot is a story about a psychologist named Dr. Josef Klemperer who is helping a former troubled student (Patricia, played by Chloe Grace Moretz) overcome her traumatic experiences. As he investigates into this girl’s then sudden disappearance, he too becomes involved in what turns into one of the most blood drenched nightmares put on screen. “Suspiria” is completely dark in tone and gets somehow darker as the film progresses. Audiences slowly get increasingly sucked into this nightmare that came right from the mind of Guadagnino. Surprisingly, this gifted filmmaker was the man behind last year’s “Call Me By Your Name”, a touching yet heartbreaking romance that takes place in a breathtakingly beautiful setting in 1970s Italy. The very fact that he can make that one year, and then step right into a topic like this shows how ranged he can be. Many more awe-inspiring films will come from this genius’s mind and he will surely continue to bring us to places we never thought we could go. Mia Goth is brilliant and Chloe Grace Moretz gives us something captivating that she’s never done before. However, this is Dakota Johnson’s most transformative role. Given her roles in the “Fifty Shades” movies, she needed a film that could set her on the path for more diverse roles. “Suspiria” will, without a doubt, give her more chances to express her talents. Although, as great as she is, the big talk about this film is Tilda Swinton as there is a secret about her performance that has been revealed to the public. However, for those who don’t know, its better to not look it up. Realizing after movie will have much more of a mind-blowing effect. That said, her talents shine bright here. The make up department for “Suspiria” deserves massive praise. There is a scene about thirty or forty minutes into the film that induces nausea. An incredible amount of makeup had to be put to work for this scene to come to life, and its one of the most horrifyingly realistic body horror scenes ever made. You’ll know it when you see it, trust me. The film’s nightmarish qualities come to life through its mixing of horror sub-genres. It mixes body horror with supernatural and psychological horror. There are some incredibly grotesque scenes throughout, and from start to finish there is a foreboding feeling of dread that stays in our minds, even hours after viewing, much like in “The Shining”. 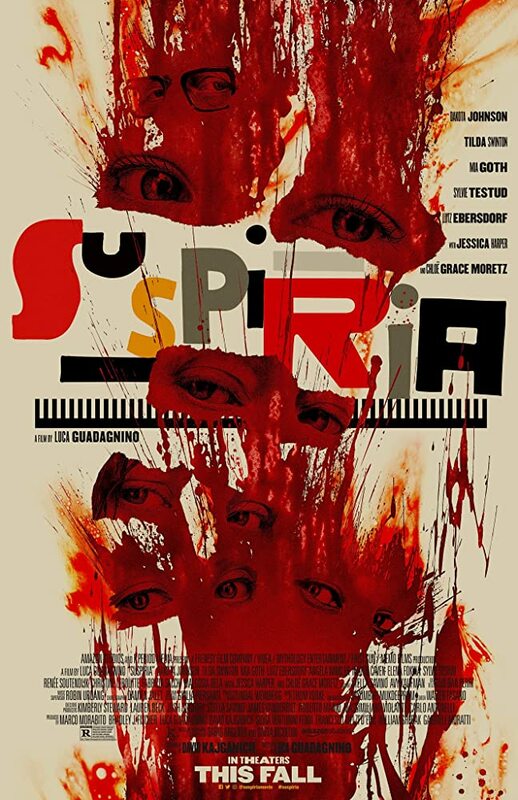 “Suspiria” is clearly inspired by countless other horror films but takes many visual inspirations from the works of Stanley Kubrick and emotional ones from David Lynch (“Eraserhead”, “Blue Velvet”, “Mulholland Dr.”). Watching “Suspiria” is an experience different from any other, one that many will not dare to venture on. Admittedly, it’s not for everyone. It’s weird, creepy, and not at all like the other conventional type of horror films that are constantly released (“The Nun”, “The Conjuring” etc). This film can’t be confidently recommend for everyone, but it’s worth the shot and is masterfully crafted enough to deserve attention and praise as one of the greatest horror films ever made.